Driving Lessons in Chester with our professional instructors will be fun, professional and educational. As all our instructors are trained by Nigel Richards Driving School, CRB checked and regularly monitored to ensure high instructional standards. We have been delivering quality instruction in the Chester area for many years and pride ourselves on our excellent local reputation. The prospect of learning to drive in city such as Chester can be quite unnerving, but don’t worry as all our instructors are calm, professional and trained to deal with all aspects covered in the recommended syllabus supplied by the Driving and Vehicle Standards Agency. Our Chester based driving instructors are achieving a much higher pass rate than the National average due to their knowledge of the area, professionalism and experience of judging when their pupils are ready to pass their driving tests. Chester offers a large variety of road types and conditions that can be encountered on the driving test routes. There are some superb nursery routes in the Hoole, Blacon and Lache areas that offer quiet areas where learner drivers can develop their finer car control skills before venturing out onto the busier free flowing traffic areas such as Overly roundabout, Liverpool Road and the A55 dual carriageway. Many of the manoeuvres on the driving test are carried out in the suburban areas but the forward and reverse bay parking exercises can be done in the driving test centre or in a supermarket and public carparks. The driving test centre was in Dickson Drive for many years but moved to Saighton Army camp a few years ago and has recently moved again to Unit 16, Telford Court, Dunkirk, Trading Estate, Chester Gates, Dunkirk, Chester, Cheshire CH1 6LT. This move of centre to outside the city now puts it very close to Ellesmere Port which means some of the routes now incorporate the Ellesmere Port suburbs. 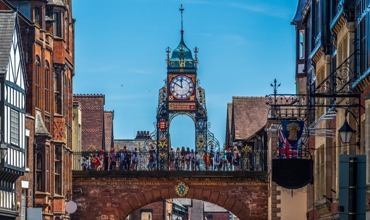 The driving test routes can also take you into Chester as well as many country road areas and your are likely to have your ability assessed on a dual carriageway such as the A494 or the A55. You will be asked to complete one reversing exercises such as parallel or bay parking or parking on right hand side of the road and reversing backwards two car lengths before moving off again. The emergency stop is also something you could be requested to perform but it is only a one in three chance or being requested to do that.